Do I have a Glioblastoma? You might find yourself feeling sorry for the doctor that diagnoses a Glioblastoma. This is the kind of illness that makes physicians struggle for lame optomism like "At least we know what's wrong with you," or "I can refer you to good specialist." Then your doctor will go home, have a couple of martinis and try to forget about it -- leaving you to absorb a life-changing event. Maybe it started as a dull intermittent pain in your head, although about half of victims never have a headache. 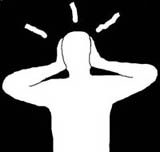 You might have had a seizure -- the presenting symptom in 10% of patients. Perhaps you had a mental status change or vague neurological complaints that prompted a CT scan. If a growth is discovered, don't give up hope -- many brain tumors are benign and require no therapy, or you might have a stray metastasis from a treatable malignancy elsewhere in your body. But if you turn out to have Glioblastoma, you are the owner of a worst-case scenario. Glioblastoma Multiforme is the most common primary brain malignancy -- and one of the deadliest, typically causing death within three months if untreated. Massive and disabling brain surgery combined with radiation treatment may add a year or two to your life, but the tumor typically returns, and the treatment cycle is repeated with diminishing benefits. Glioblastomas can strike any age (average at about 50) and are aggressive -- containing an unpredictable mix of infiltrating cell types that are resistant to chemotherapy. Although the occasional patient can hope for a cure, your chances of being alive five years after the diagnosis are about one in fifty. Is there an upside to Glioblastoma? High dose steroids can temporarily reverse inflammation around the tumor, giving you an opportunity to say goodbye to relatives and set your affairs in order. 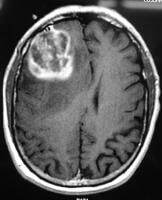 Although the final days can be difficult, at least Glioblastoma is seldom painful compared to other types of cancer. Don't worry about your kids getting it -- Glioblastoma rarely has a genetic cause. Feel free to use your cell phone -- radio waves have not been shown to contribute to brain tumor formation. The tumors are rare among black people. And best of all, your doctor won't have to diagnosis them too often. Your chances of getting one this year are only .003 %.